This Heart diamond is 0.31 carat in weight, and comes with Excellent polish and Very Good symmetry, as verified from an independent gemological laboratory. The diamond is graded F in colour, and has a clarity grade of SI1. The diamond's GIA grading report number is 2307957172, which will detail further its specifications and measurements, and will also come with the purchase of the stone. AUD 6,576 Excl. Duties / Taxes. This Heart diamond is 1.07 carat in weight, and comes with Excellent polish and Excellent symmetry, as verified from an independent gemological laboratory. The diamond is graded F in colour, and has a clarity grade of SI1. The diamond's GIA grading report number is 2166928686, which will detail further its specifications and measurements, and will also come with the purchase of the stone. This Heart diamond is 0.92 carat in weight, and comes with Very Good polish and Very Good symmetry, as verified from an independent gemological laboratory. The diamond is graded H in colour, and has a clarity grade of SI1. The diamond's GIA grading report number is 1308060814, which will detail further its specifications and measurements, and will also come with the purchase of the stone. This Heart diamond is 0.32 carat in weight, and comes with Excellent polish and Very Good symmetry, as verified from an independent gemological laboratory. The diamond is graded F in colour, and has a clarity grade of VS1. The diamond's GIA grading report number is 2306913587, which will detail further its specifications and measurements, and will also come with the purchase of the stone. This Heart diamond is 0.5 carat in weight, and comes with Excellent polish and Very Good symmetry, as verified from an independent gemological laboratory. The diamond is graded E in colour, and has a clarity grade of VVS1. The diamond's GIA grading report number is 6312304044, which will detail further its specifications and measurements, and will also come with the purchase of the stone. 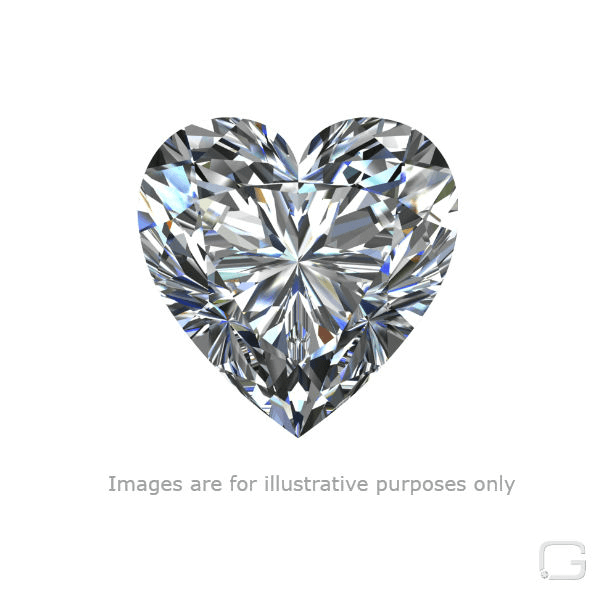 This Heart diamond is 1.01 carat in weight, and comes with Excellent polish and Good symmetry, as verified from an independent gemological laboratory. The diamond is graded I in colour, and has a clarity grade of VS1. The diamond's GIA grading report number is 2155783694, which will detail further its specifications and measurements, and will also come with the purchase of the stone. This Heart diamond is 1.01 carat in weight, and comes with Excellent polish and Very Good symmetry, as verified from an independent gemological laboratory. The diamond is graded F in colour, and has a clarity grade of SI1. The diamond's GIA grading report number is 5313902220, which will detail further its specifications and measurements, and will also come with the purchase of the stone. AUD 2,095 Excl. Duties / Taxes. This Heart diamond is 0.65 carat in weight, and comes with Excellent polish and Excellent symmetry, as verified from an independent gemological laboratory. The diamond is graded F in colour, and has a clarity grade of VVS2. The diamond's GIA grading report number is 5326000987, which will detail further its specifications and measurements, and will also come with the purchase of the stone. This Heart diamond is 2.01 carat in weight, and comes with Very Good polish and Good symmetry, as verified from an independent gemological laboratory. The diamond is graded H in colour, and has a clarity grade of SI2. The diamond's GIA grading report number is 14305825, which will detail further its specifications and measurements, and will also come with the purchase of the stone. AUD 47,553 Excl. Duties / Taxes. This Heart diamond is 2.2 carat in weight, and comes with Very Good polish and Good symmetry, as verified from an independent gemological laboratory. The diamond is graded E in colour, and has a clarity grade of VS2. The diamond's GIA grading report number is 2161698470, which will detail further its specifications and measurements, and will also come with the purchase of the stone. AUD 3,484 Excl. Duties / Taxes. This Heart diamond is 1.03 carat in weight, and comes with Excellent polish and Very Good symmetry, as verified from an independent gemological laboratory. The diamond is graded I in colour, and has a clarity grade of SI2. The diamond's GIA grading report number is 1297262291, which will detail further its specifications and measurements, and will also come with the purchase of the stone. This Heart diamond is 0.34 carat in weight, and comes with Excellent polish and Very Good symmetry, as verified from an independent gemological laboratory. The diamond is graded H in colour, and has a clarity grade of VVS1. The diamond's GIA grading report number is 7313540595, which will detail further its specifications and measurements, and will also come with the purchase of the stone. AUD 15,560 Excl. Duties / Taxes.